New Hope for Transitional Justice in Congo? GOMA, Democratic Republic of Congo — A couple of weeks ago, with elections fast approaching, some felt a renewed hope for transitional justice in Congo. A coalition of rights groups introduced “Justice Now for the DRC,” a countrywide campaign aimed at improving Congo’s justice system and securing government financial and political support for it. 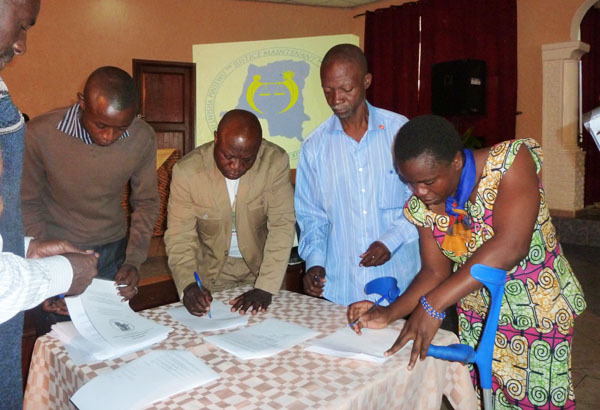 Justice Now, led by local human rights organizations from eight provinces, launched in November in Goma with the participation of 18 aspiring national representatives. They were encouraged to sign a social contract for justice and the fight against impunity in Congo, including through the creation of a Specialized Mixed Court. But the Justice Now initiative faces an uphill battle. The proposed mixed courts have faced powerful opponents ever since the concept was suggested as a remedy to addressing significant shortcomings of the Congolese judicial system. A brief backstory: Following the long overdue release of the U.N. Mapping Exercise Report in October 2010, about 250 local and international organizations called for a transitional justice system to prosecute international crimes not falling under the jurisdiction of the International Criminal Court, or ICC. Discussions between human rights advocates and the Congolese government led to the drafting of a bill to establish a Specialized Mixed Court to prosecute international crimes committed on Congolese soil since 1990. This past August, Congolese senators met in a special session and, contrary to all expectations, refused to accept the proposed bill and returned it to the government. They argued that Congo’s sovereignty would be undermined by the presence of international personnel and that the budget required was beyond the government’s means. They also raised concerns over the law’s overlap with the International Criminal Court’s Rome Statute, which Congo adopted eight years ago but has yet to implement. While there may be some hesitancy about procedural issues, it is safe to say that another concern about adopting the Specialized Mixed Court law is that many of those in power in Kinshasa today are directly implicated in the abuses and human rights violations that took place in the eastern provinces during the time period covered by the report. As a result, they fear indictment and prosecution. The proposed bill resulted from regular consultations between Congolese authorities, national and international civil society groups, and potential donors. It was supposed to fill the gaps of both the weak Congolese justice system and the lack of the ICC’s jurisdiction over international crimes committed before 2002, the year the Rome Statute instituting the ICC was signed. The Senate's dismissal of the bill was a serious setback to extensive efforts to bring justice to victims of human rights violations, in accordance with international conventions Congo has ratified. I hope this is not a group of hypocrites who calls for the fight against impunity without real follow-up. I was in church one day and an old woman, who has been affected by violence, prayed that if God was unable to touch the hearts of those responsible for violence and make them stop, she would tear out all verses in the Bible that say God is just. We do not need fake promises of reform. Congolese people need a revolution and reform from top to bottom. Justice Now for Congo has raised hope that the incoming legislators will revive the conversation about establishing the Specialized Mixed Court, which would be a crucial step in advancing justice and ending impunity in Congo.